Like bacteria, viruses have existed for millions of years, yet even after all this time we still don’t really know when or how they evolved. Viruses are grouped into families based on their genome, which can be either DNA or RNA. This virus, provisionally named BSL RDHV (Boiling Springs Lake RNA–DNA hybrid virus), is unusual because it seems to be a mix of both DNA and RNA viruses. A typical virus consists of genetic material (DNA or RNA) surrounded by a protein shell; the genetic material in this newly discovered virus is DNA, yet its shell contains a protein similar to those found in RNA viruses. Through an unusual recombination event, the DNA virus seems to have picked up a gene from an RNA virus. Whereas DNA–DNA and RNA–RNA recombinations are well understood, we don’t understand how DNA–RNA recombinations work. 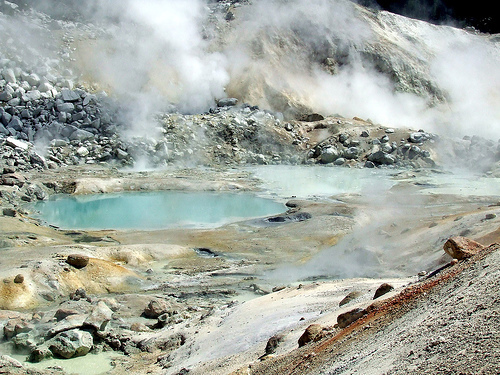 The new virus was discovered by researchers in the acidic Boiling Springs Lake at Lassen Volcanic National Park, USA. The researchers collected and analysed samples of DNA from the lake’s sediment, identifying the virus and its unusual RNA-derived gene. This technique, known as metagenomics, allows scientists to investigate genetic material from environmental microorganisms directly, instead of first growing them in the lab. This new discovery is an important step in understanding virus evolution: it seems likely that RNA viruses evolutionarily preceded DNA viruses, so the authors speculate that the incorporation of RNA genes by DNA viruses might help to explain this branch of evolution. Couldn’t it be that the RNA cistron was first horizontally transferred to a retrovirus, where the reverse-transcription occured, and then the reverse-transcribed sequence was again horizontally transferred to BSL RDHV where the recombination into its genome happened?